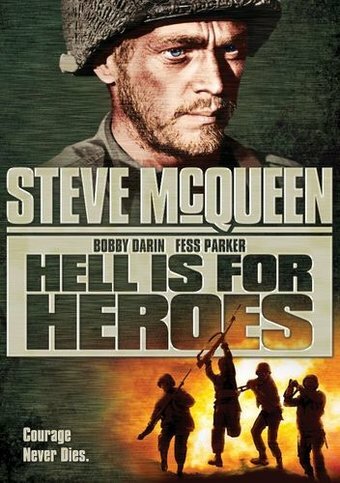 A perfect example of what critic Manny Farber once described as "termite art"--that which burrows under and gets inside its subject rather than indulging in rhetoric--HELL IS FOR HEROES stars Steve McQueen as the rebellious G.I. John Reese. In the fall of 1944, he's busted from staff sergeant back to private for drunkenness and is sent back to his former outfit, currently stationed near the Siegfried Line in Montigny. Reese's bitterness about his demotion isolates him from the rest of the squad, although they've observed his courage under fire in previous combat missions. When the unit is assigned to defend an area facing a German pillbox, Reese's skills become evident. He advises squad leader Sgt. Larkin (Harry Guardino) on a ruse that creates the illusion that their unit is much larger than it is, temporarily deflecting an attack. The squad has been ordered to simply hold their ground, but believing it's only a matter of time before the Germans discover that they've been deceived, Reese leads an attack on the pillbox. 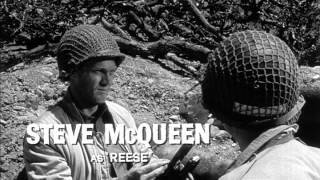 McQueen is excellent in this solid, realistic grunt's-eye-view of combat, which suggests that sociopaths make the best soldiers. James Coburn and Mike Kellin do fine work, and Bob Newhart is featured in a strangely anomalous comic turn. The two-fisted action team of director Don Siegel and star Steve McQueen (they also paired in BULLITT) takes on the World War II foxhole drama. A group of American G.I.s tries to defend a key battle line against enemy fire, but to do so the men must convince the Nazis that they are a large Allied task force. Shooting locations: Cottonwood and Redding, CA. Excerpts from a speech by JFK appear as a prologue. Don Siegel replaced previous director Robert Parrish, who had trouble relating to Steve McQueen.